Friday, June 10th at 10:30pm. Tickets $5 at the door. Join the studio audience for Phoenix Tonight, the Valley’s live late night talk show! 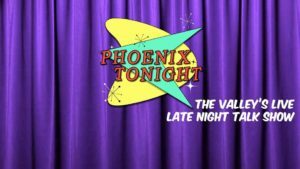 Hosted by Russ Kazmierczak, Jr.
Phoenix Tonight will feature the Valley’s best and brightest talent, in the traditional talk show format that you know and love! Check out last month’s interview with KTAR’s Bruce St. James!